I have been working on a project to show you, but I have also been working at and attending our high school divisional basketball tournament, so the project is taking a bit longer than expected. Here is a sneak peek, do you have a guess? I will show you the finished project on Monday, plus a little bonus project for being so patient. Also, can any of you oh so kind and wise people tell me how you can get the blog roll that shows how long ago someone updated? I like those. Time to head to basketball, for the next seven hours. Happy weekend! Sweet Jen at Sanctuary Arts at Home is having a make-over, trash-to-treasure party. I had a hard time deciding what to show you (I have shared this before, but hopefully it is new to some of you). Not because everything I do is so wonderful, but some projects do become like babies to you--it is hard to pick your favorite! 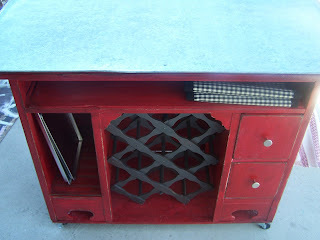 But this is one of my favorites I guess because it was made from objects found roadside or for free at garage sales. I started with a desk that was sitting on the side of the road with a free sign on it. I took out the drawers on one side because they were broken. 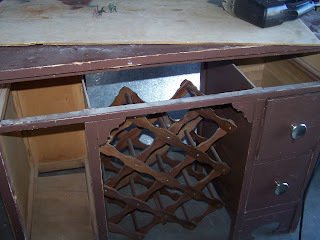 I also took out the center drawer because it was broken and turned it around to make a shelf. 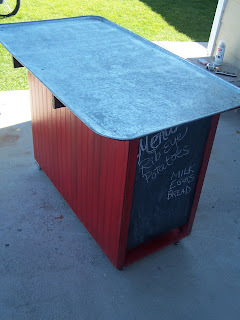 I added a metal oil drip pan (I think that is what it was), letting it overhang on the backside for seats and beadboard. 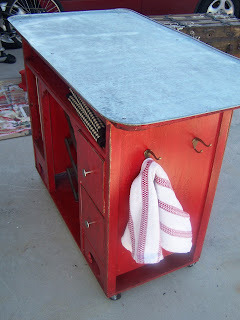 I used a board across the bottom, put wheels on it , a wine rack, hooks on one side and chalkboard paint on the other, and painted it red. It was fun to come up with the different components and it sold right away! Go to Jen's site to check out more fabulous make-overs. It was a beautiful day yesterday. 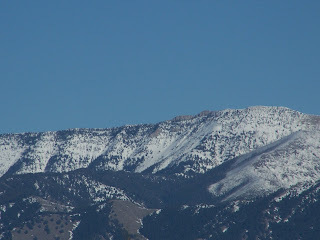 This was the view from my front porch (minus some rooftops and electrical wires that I cropped out of the picture). How would our days be different if we chose to go out in joy each day, being led by God's peace? What if we took the time to look for nature bursting, exploding in song before us? For just this week, try to start each day going out with joy and being led by peace. 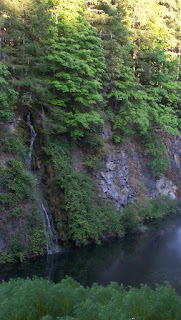 Have a joyful, peaceful, bursting into song kind of a week! 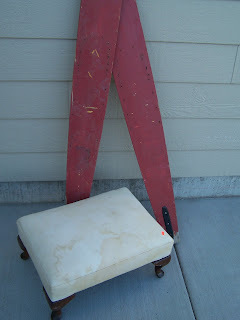 Some water skis (not an item often found here) and one nasty looking ottoman. 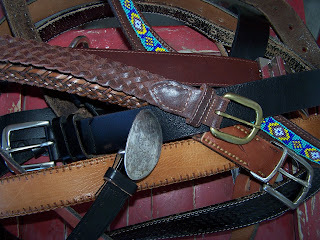 A plethora of leather belts--I have a few projects I want to do with these. 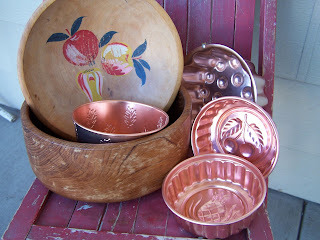 A couple of wooden bowls, I will paint the larger one, and some copper molds. 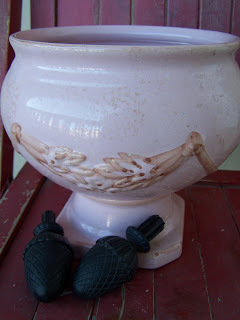 A great pink compote (it is made for food) and some finials. 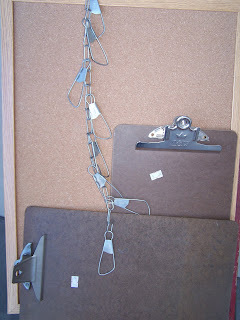 A few clipboards, a bulletin board that will be put into a frame or something, and a fish chain thing. 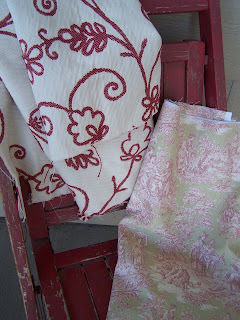 And finally a few fabric remnants. I actually got quite a bit of the red and white. Tune in tomorrow to see what it looked like out my front door today Ü. On Tuesday my 12 year old and 7 year old tested positive for influenza B--it has been a lonnnnng week! The past two day they have been well enough to fight and annoy each other, but too sick for school. Dear hubby came down with it last night. 1 sick husband=2 sick kids. Tell me you get this equation. 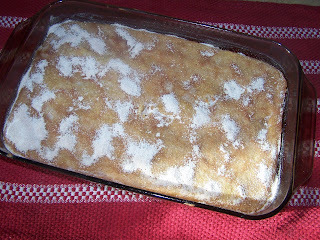 Today I did bake these yummy bars--a recipe from my childhood. Mix together. Pour into greased 9x13 pan. Bake at 375 for 20 minutes. 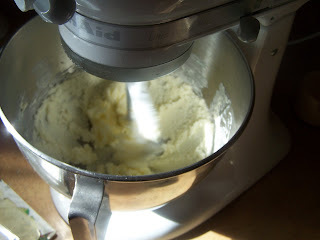 Remove from oven and top with 3/8 C. melted butter and then sprinkle with cinnamon and sugar. Enjoy! 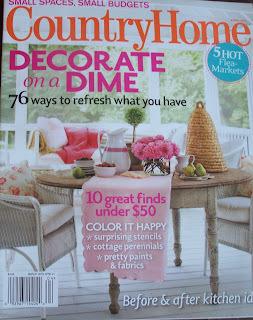 Well, as most of you know, this is the last issue of Country Home magazine. It is also the first (and subsequently the last) issue that I was able to contribute a project to. I had hoped to continue to make contributions for the cool junk section. 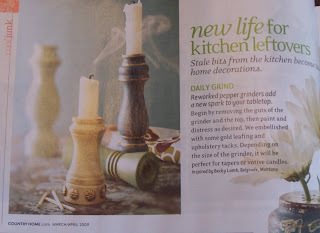 These are some candleholders I make from pepper grinders. Nothing earth shattering, but something I came up with because I rarely find baulesters to use for candleholders. The ones pictured are ones I sent them, they added the tacks and leafing (which I really like). Country Home found me via my blog (yea for blogging!). Everyone I talked to and worked with was very sweet, especially Kelly. I just hope that they were able to find other positions in the magazine world. So if you get a chance--check it out. I am a little late today in posting. I chose this verse for the week because I, along with many friends were lamenting about hectic schedules and lives. This verse reminds me that I do nothing without God and that He will give me the rest I need. Tired? Busy? Stressed? Rest in God's mighty presence. So, I didn't get to any actual junking projects. I looked at some of my pieces, turned them around, put some together, and came up dry. 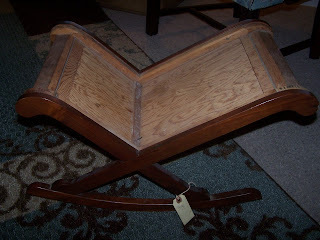 This little rocking chair is one of the pieces I am thinking of repurposing or just recovering. I got it for$7 at the thrift store. It had a tag with my name on it, so I had to buy it. 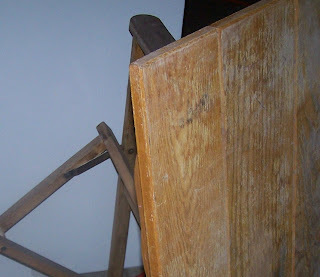 I think it is old--constructed with straight screws and nails. Anyone know why it tips back so far? Were these rockers intended for babies? I did a little rearranging on top of my TV armoire. 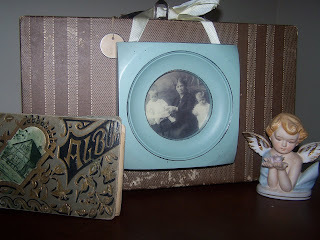 I love this little picture frame--the people in it came with it. I will replace it with real relatives some day. 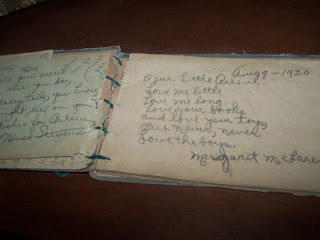 The angel figurine is from my grandma and the autograph book belonged to my other grandma. Happy Valentine's Day--we are off to a basketball tournament for the day--aah, how romantic! Does Your Kitchen Table Look Like This? It has been a a busy valentine week. 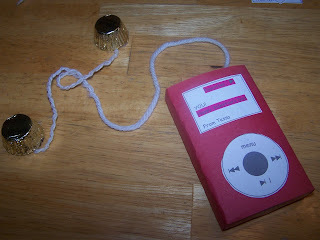 This was from tonight's valentine making adventure for my daughter (got this cute idea from somewhere out there in blogland). Middle son was happy with Fun Dips (a sugar stick that gets dipped into colored sugar-mmm!). 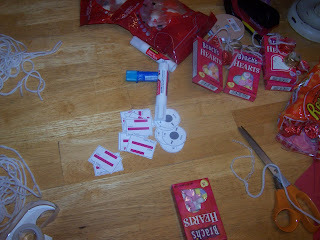 I have also made 24 valentines for preschool, 24 valentine bags, cut out approximately 500 hearts, and taped crayons and pennies to 200 hearts. I am not complaining (or am I? ), but it has seemed busy. I did love Valentine's Day as a kid--it was my favorite holiday to celebrate at school. I hope to get to some junking projects tomorrow after preschool. Hope you all are enjoying the week. This verse was part of the Esther study by Beth Moore this past week. It really stuck with me. Sometimes I wonder if I have missed the Lord's purpose for me or my life. 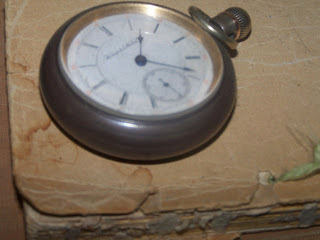 Have I let too much time tick by for God to use me as He wants? Beth talked about how we may be one brave decision away from the most important turn in our life. Sometimes we protect ourselves right out of our true callings. But this verse assures us that God is working it out--fulfilling his purpose for us and that He will never abandon us. Trust Him to fulfill his purpose in you. 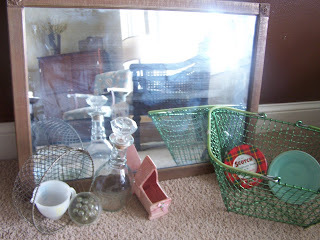 I made it to a few thrift stores and found a couple of treasures. I love this mirror--it needs a good cleaning! It is old--extremely heavy. I also got this green market basket--not sure what for but I liked it. I might just keep potatoes in it in the pantry. 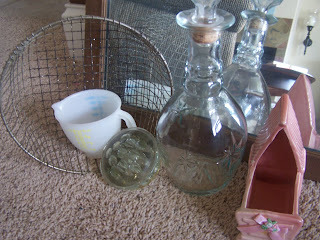 I also found: another glass decanter for $1, a glass flower frog, a vintage baby flower container, an old scotch tape can, a pretty blue saucer, a round wire basket (not sure what I am doing with this, but I liked it), and the cute little tupperware measuring cup for preschool. So, not a big haul, but I still am pleased with my goodies. Sweet girl is 7 today. I tried to find a baby picture, but I wasn't digital then and my scanner isn't working. When she was born, I was sure she was going to be a boy. I had already had 3 boys, so I just assumed she was one too. I had the boy clothes in the dresser and the room ready for dinosaurs. I was so surprised when they told me it was a girl! 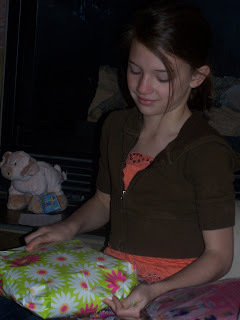 We had to open gifts this morning at 7 before school. 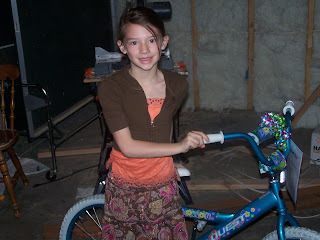 She had a hunt to find her new bike (it was in the basement that is being finished). 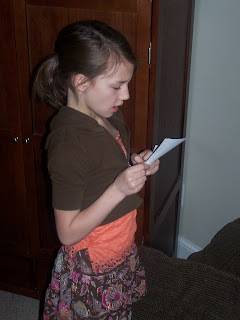 She read all of the clues by herself. We had family birthday dinner tonight and ice cream pie. My kids only get birthday parties on even years, so this was a no party year. It was a nice day--boy they do grow fast, don't they! 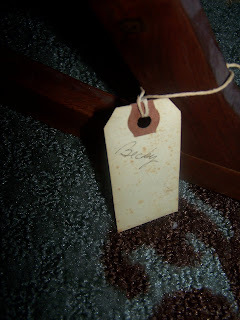 Tomorrow I am hitting some thrift stores and trying to work on a few projects, so check back to see what I found! Have a good Friday! I found these three great saucers the other day at the thrift store for a quarter each. I loved the colors, but couldn't find the tea cups to go with them, and had no idea what I would do with them. I came up with this quick project today. 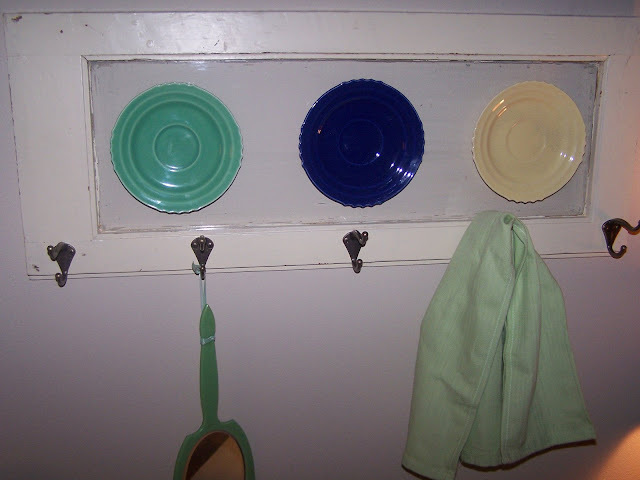 I used epoxy to glue them to this old glass cupboard door I have had (click here to see another project I made with one of the doors). I then added 5 hooks-simple and quick. It will go to my antique booth later this week.